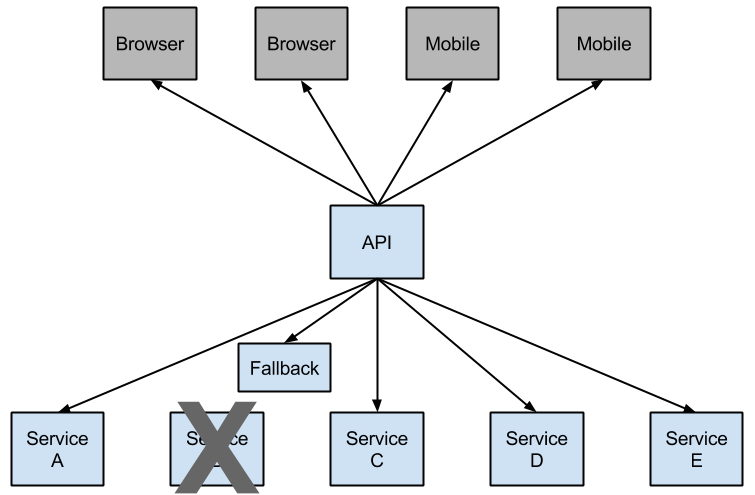 A service failure in the lower level of services can cause cascading failure all the way up to the user. When calls to a particular service exceed circuitBreaker.requestVolumeThreshold (default: 20 requests) and the failure percentage is greater than circuitBreaker.errorThresholdPercentage (default: >50%) in a rolling window defined by metrics.rollingStats.timeInMilliseconds (default: 10 seconds), the circuit opens and the call is not made. In cases of error and an open circuit, a fallback can be provided by the developer. Having an open circuit stops cascading failures and allows overwhelmed or failing services time to recover. 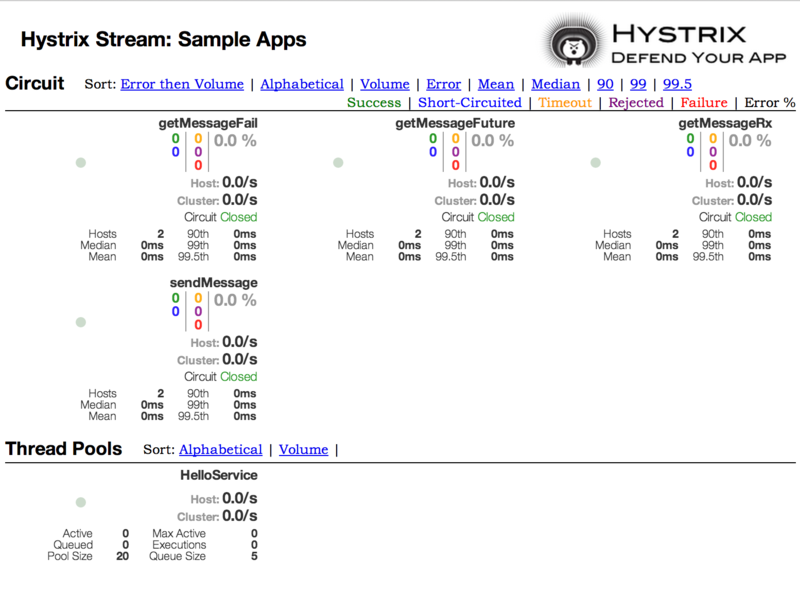 The fallback can be another Hystrix protected call, static data, or a sensible empty value. Fallbacks may be chained so that the first fallback makes some other business call, which in turn falls back to static data. To include Hystrix in your project, use the starter with a group ID of org.springframework.cloud and a artifact ID of spring-cloud-starter-netflix-hystrix. See the Spring Cloud Project page for details on setting up your build system with the current Spring Cloud Release Train. The @HystrixCommand is provided by a Netflix contrib library called “javanica”. Spring Cloud automatically wraps Spring beans with that annotation in a proxy that is connected to the Hystrix circuit breaker. The circuit breaker calculates when to open and close the circuit and what to do in case of a failure. To configure the @HystrixCommand you can use the commandProperties attribute with a list of @HystrixProperty annotations. See here for more details. See the Hystrix wiki for details on the properties available. The same thing applies if you are using @SessionScope or @RequestScope. If you encounter a runtime exception that says it cannot find the scoped context, you need to use the same thread. You also have the option to set the hystrix.shareSecurityContext property to true. Doing so auto-configures a Hystrix concurrency strategy plugin hook to transfer the SecurityContext from your main thread to the one used by the Hystrix command. Hystrix does not let multiple Hystrix concurrency strategy be registered so an extension mechanism is available by declaring your own HystrixConcurrencyStrategy as a Spring bean. Spring Cloud looks for your implementation within the Spring context and wrap it inside its own plugin.